From 1900 to 2010, the amount of materials accumulated in buildings and infrastructure across the world increased 23-fold. We are depleting our resources at unprecedented rates. Instead of extracting dwindling raw materials from nature at ever-increasing cost, the time has come to start re-using materials from buildings and infrastructure in our cities. We have been working on identifying the material resources in cities that could be "mined" for re-use. In a case study, we modelled more than 13,000 buildings in central Melbourne, Australia. We estimated the quantities of construction materials as well as the embodied energy, water and greenhouse gas emissions associated with constructing these buildings (if they were built today). We also modelled the replacement of materials over time and into the future. The extraction and transformation of resources have broad environmental effects. These include resource depletion, loss of biodiversity, soil and water pollution, and greenhouse gas emissions, which drive climate change. Adding to these challenges is the amount of waste generated, especially by the construction sector due to construction, renovation and demolition activities. Every time a construction material is discarded, all the embodied energy, water and emissions that went into producing it also go to waste. In our two recent studies, we propose a model that can help us "mine" our cities and quantify the environmental benefits of this urban mining. We used the City of Melbourne, representing the central business district and immediate surrounds, as a case study. 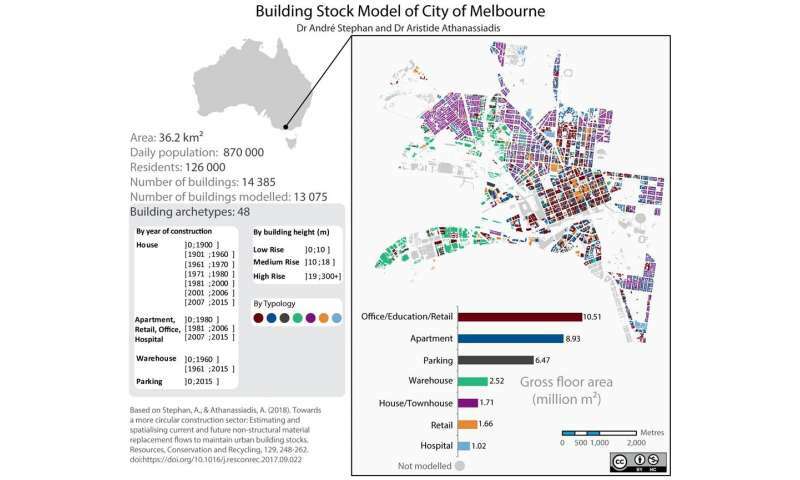 This is because the City of Melbourne offers open-source and high-resolution data that allowed us to model the materials found in individual buildings. By combining the Census of Land Use and Employment database with the Building Footprints database, we had access to basic geometric and construction-related data for each of the 14,385 buildings in this area in 2015. Of these, we modelled 13,075, as some very small or unique buildings (stadiums, railway stations, etc.) had to be discarded. We used 48 building archetypes, based on the building type (e.g. office), construction year (e.g. 1987) and height (e.g. 25 metres), to represent the different buildings in the city. Results show that the City of Melbourne has a stock of 1.5 million tonnes of materials in every square kilometre. Just replacing worn materials to maintain this built stock is estimated to require 26 thousand tonnes of materials every year. 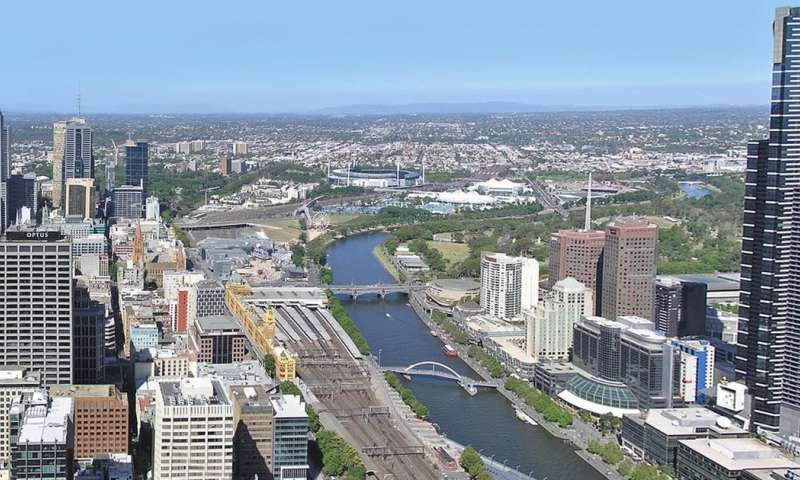 Rebuilding the City of Melbourne today would use about 10 petajoules of energy and 17.7 million cubic metres of water. The construction would emit 605,000 tonnes of greenhouse gases per square kilometre. These resource requirements are simply huge. For instance, the energy used for every square kilometre built is enough to drive 700,000 cars from Melbourne to Sydney. Picture all the urban development around the world, then just try to imagine all the resources required. Aside from producing these overall estimates, the real value in our model lies in the detail it provides about the use of materials in the city. It can answer questions such as where and when construction materials are needed, and in what quantities. And what are the associated environmental effects? 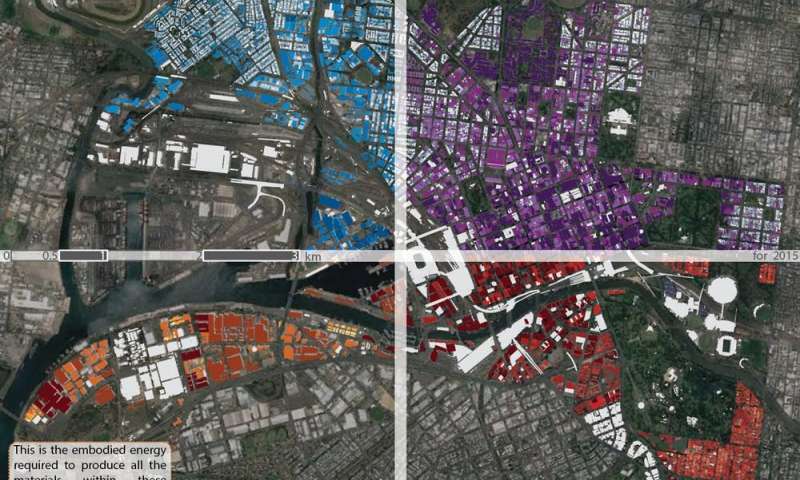 For the 13,075 buildings modelled, we ended up with more than 500 million data points. We needed to come up with effective data visualisation to inform decision-makers about how we can mine cities. The most important result we found is depicted in a map showing the quantities of each material within each building. We are able to do that for any given year or period. This enables us to track which materials are expected to be replaced in what quantities and in what buildings. These maps allow us to start thinking of cities as urban mines and places of material production (supply), rather than just consumption (demand). We can imagine how a new construction project could survey what materials would be available at its start and how it can best re-use these and incorporate them into the design. This would save large amounts of energy and water, while avoiding greenhouse gas emissions and further ecosystem degradation from raw material extraction (usually far from the city). We borrowed the concept of the age pyramid from population studies to represent the material stock in the city's buildings. This allows us to understand which materials stay in the stock and for how long. It also helps us better anticipate when a significant amount of materials is expected to be replaced, resulting in construction waste and a demand for new materials. The maps show where this is going to take place. While we have produced tools that can help with urban mining, we are still far from a truly circular economy for the construction sector. Firstly, our model suffers from a significant amount of uncertainty: it is only as good as the data we feed it. 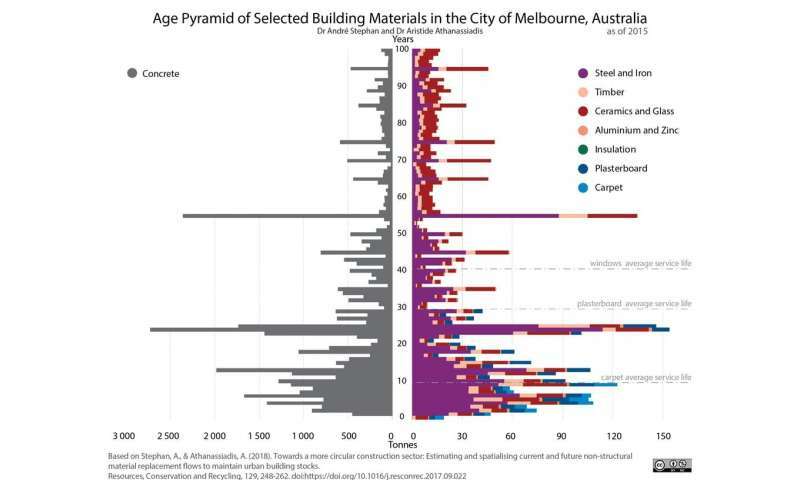 While the City of Melbourne has good-quality data for its buildings, we really struggle to estimate how long materials last, notably at the scale of a building. We need more research and data to better estimate the material composition of buildings, the periods of material replacements or building refurbishments, as well as the materials released and available for re-use. Secondly, we need to better design our buildings for disassembly. A material that is being replaced is not directly re-usable in most cases due to wear or damage, possibly during demolition. If we design and prefabricate modular buildings that can easily be disassembled, we can greatly improve the potential for re-use and recycling. This would help us move towards zero-waste cities. A third way forward is to rethink how construction materials and systems are designed and for what purpose. Instead of buying carpet for an office, a company could pay for the service "floor area covered by carpet". This would shift ownership of the carpet to the supplier. In turn, that would create an incentive to produce durable, high-quality materials that could be re-used and recycled, instead of programmed obsolescence. Such business models are already starting to emerge. With our growing global population, finite resources and climate change, we need to move fast towards a more circular construction sector to help ease the pressure on the Earth's resources and ecosystems. Models such as the ones we are developing are a step forward on a long journey.